If you have only 6 days for Vietnam vacation, Hanoi is the best destination with most interesting attractions of Vietnam tours like an ancient charming capital, fascinating Halong Bay, stunning perfume pagoda, peaceful and beautiful Tam Coc... Join Hanoi tour, the bestselling of Vietnam holiday packages. Limited offers. Trip name: Amazing Hanoi Vacation. Trip Code: HN - 01( + Departure date). Length of the trip: 6 days and 5 nights. pick up at the airport. Transfer to your hotel. If possible, join a cycling tour around busy commercial old quarters. Enjoy waterpuppet show( puppets are dancing on the surface of water). 8:30 First, see Ho Chi Minh Mausoleum(close on Monday and Friday), his Stilt house in a very beautiful garden, the One Pillar Pagoda and the museum of ethnology where you can see the daily used objects and costume of 54 Vietnamese groups. Afternoon, visit the Temple of Literature. Then, walk around the old quarter and discover Hanoians daily life. Surely, Hanoi is one of highlights for your Vietnam holidays. After lunch in a local restaurant, visit charming Thien Tru pagoda surrounded by green forested limestone mountains. Then, take the rowing boat back to your car. Drive to Ninh Binh for overnight. Visit Hoa Luu, the ancient capital of Vietnam with the Dinh and Le temples hidden in a very big area of limestone mountains. Then, take a seat on a sampan to Visit three caves in beautiful nature of rice paddy fields, river and many forested limestone mountains. After lunch in a local restaurant, visit Bich Dong pagoda in peaceful and beautiful landscape. Overnight in Ninh Binh. 8:30 depart to Halong city. Upon arrival, get on private Halong bay cruise and start touring Halong bay through many of 3000 forested limestone islands. The first stop for your Halong bay tour is Thien Cung cave and a floating fishing village. Have lunch while your boat is cruising Halong bay. 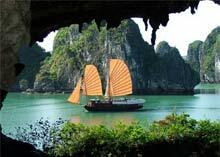 Now, you understand why visit Hanoi, join Halong Bay tours. Overnight in Halong city. Pick up at your hotel. Transfer to airport. Ends your Hanoi vacation. Visit Hanoi, the best of Vietnam holiday packages. If you are not satisfied with Hanoi tour, get your money back.